Maybe you’ve noticed that funny looking gear logo on our advertisements or on our website and wondered, “What is that?” Maybe you’ve heard of open source, and you’re wondering how a bunch of products aimed at model railroaders really fit into that. What that logo means is that we release all of the design files necessary to produce or modify any of our products – schematics, board layouts, and source code – if you were so inclined. Generally speaking, you’ll find the latest production version on the “Documentation” tab of any product in our store. For those non-technical users – which we realize a vast majority of model railroaders are – it’s a safeguard against obsolescence. How many of you have some piece of electronics on your layout where the manufacturer has disappeared, or doesn’t support the product anymore? If yours breaks, you’re out of luck unless you can find another used one or can find someone capable of reverse-engineering it to repair it. Even then, with so much of modern electronics being implemented in software, if you don’t have the source code you’re usually out of luck. With our products, all of the documentation and source code that someone would need to find and correct the issue is readily available (and I know from personal experience that nearly every model railroader who isn’t proficient in electronics has an “electrical guy” on speed dial). For those of you who are technically inclined, it gives you the freedom to modify and improve our products easily, and to use them in new and innovative ways that we never considered. We serve a pretty broad customer base, so we need to design to make our products flexible enough to fit a number of use cases without making the configuration so horrible that nobody can figure it out. Sometimes, though, that just doesn’t meet your use case. You have access to all of the design files, which should make it a breeze to modify our products to your unique needs and then share those changes with others. It also helps us as a company. It forces us to keep innovating and improving our products. Many manufacturers think, “Nobody will be able to duplicate product X and folks are still buying it, so why should we make it better?” We put our designs out there for everyone. If you want to make your own we don’t have any problem with that, but we think the real value is in continuous innovation, quality tested products and outstanding support. Michael and I both have a long history of creating and using open source software and hardware. I’ve personally been posting schematics and source code for things I build (both modelling-related and otherwise) for almost two decades now. When we started ISE, there wasn’t any question – our publicly-available products would be completely open. If you come up with some really cool way to use one of our products, or a way to improve it or change it, or do something we never thought of, please tell us about it – we’ll likely put a write-up in the blog about what you’ve come up with and link over to you. (Not to mention we’ll throw some tasty discount codes your way, or maybe even free hardware…) Even if you only have an idea of how one of our products could be better, but have no idea how to implement it, send us an email. There’s a chance that we’ll just build it into the next version, or could create a one-off to fit your need. Can we (I) hook up this servo switch machine to a diode matrix Card? MRServo should work with typical diode-matrix type setups, but with a few caveats. It’ll work best if the diodes are set up to sink current from the control pins (meaning, common ground, and the switches connect the diode columns to ground), since the control pin is naturally pulled up. If you have a pre-existing diode matrix designed to source current from the positive, then you can probably make it work with a 1k resistor between the control and ground pins of each MRServo to change it to a stronger pull-down instead. 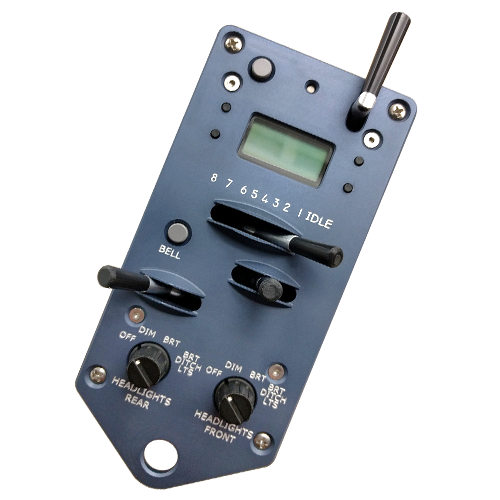 You’ll want to use on-off type switches, however, since MRServo is expecting a constant input (or a toggling input) rather than a pulse to set a direction as with twin coil machines.